The latest internal documents coming out of the Samsung/Apple trial show some candid insight into Apple's analysis of the future of the smartphone market. 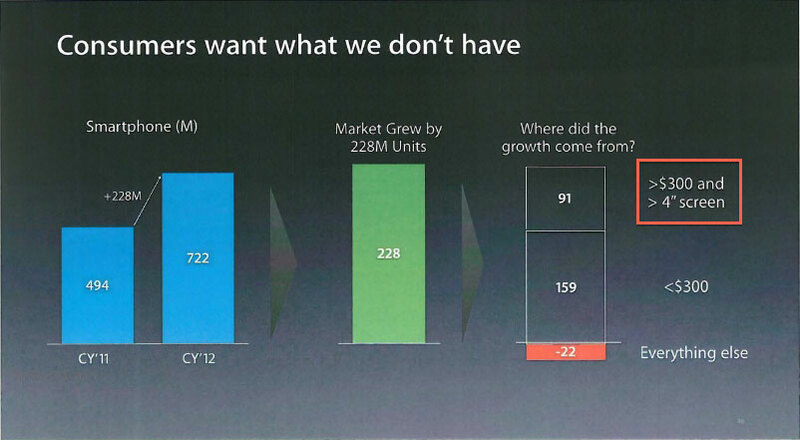 In a further breakdown, Apple acknowledges that "consumers want what we don't have" -- which shows that the majority of smartphone growth is in both >4" screen sizes and <$300 markets. Apple has been heavily rumored to be introducing a larger iPhone 6 this fall. The size of the new iPhone has been thought to be 4.7" or 5.5" with the 4.7" model coming first. 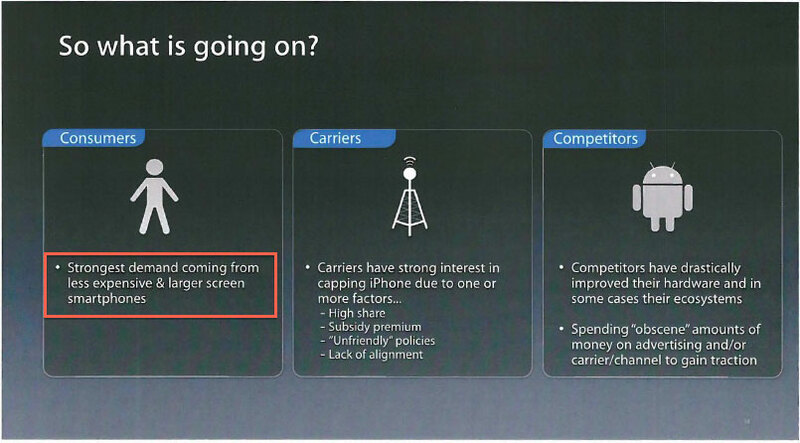 While rumors have been consistent, Apple's own insights from 2013 explain why such a move is likely to happen. Good. Nobody wants a obscenely large iPhone screen just because a few novelty Android devices have them. This quote makes me chuckle even more now! I personally just like using one hand to do everything on my iPhone 5. Breaking news: MacRumors fanboys still won't acknowledge this. "...Apple acknowledges that "consumers want what we don't have"..."
What Apple Needs is New Innovative Products. The iPhone this June will be almost 8 Years old. The iPhone Gravy Train is almost over. Its time to invent some new products. Just like the iPod had its run, The iPhone run is coming to a close soon. In other news Tim Cook has started watching the new hit TV show, "The Duh Factor"
Why are people surprised that Apple does market research? If they end up listening to the market, then they'd be facing the "innovators dilemma" which Jobs (I believe highlighted as a favorite book). It's not about giving consumers what they want. Apple will fall behind listening to their customers' needs. Edit: Apple can't get caught up in current needs. It needs to look to the future. Am I the only one who doesn't want a bigger iPhone screen? If they do that, I hope they keep the smaller one as an option. Of course, that will have the disadvantage of making developers account for yet another screen size (unless the bigger iPhone is just bigger pixels), but I really don't want to make the phone any more difficult to put in my pocket, for example. If I want to get real work done, I'll use a full-fledged computer. The things people are doing, painstakingly, on mobile devices these days scare me. #OldPeopleProblems?